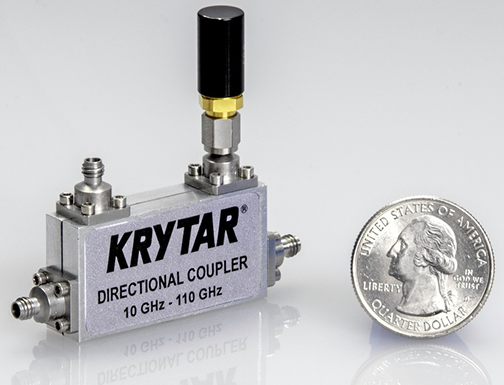 KRYTAR, Inc. has produced a new Directional Coupler operating in the frequency range of 10 to 110 GHz and offering exceptionally flat Nominal Coupling of 10 dB across the full bandwidth. KRYTAR’s new directional coupler, Model 1100110010, offers some of widest frequency coverage using on the market. This new directional coupler maintains flat 10 dB coupling across a wide 100 GHz bandwidth. The new directional coupler lends itself to wireless designs and many test and measurement applications for emerging mmWave and 5G markets. This coupler can also be manufactured to meet military specifications. The coupler will find many uses including power monitoring and leveling in many different systems, including antenna beamforming systems, electronic-warfare (EW) systems, electromagnetic-compatibility (EMC) testing, radar systems, and many wireless communications systems. This new coupler further expands the KRYTAR family of directional couplers offering superior coupling performance with 10 dB (±1.5) 10-90 GHz, and 10 dB (±1.8), 90-110 GHz. The directional coupler achieves frequency sensitivity (amplitude flatness) of typically ±1.25 dB from 10 to 90 GHz and ±1.80 dB from 90 to 110 GHz. It provides directivity of at least 10 dB from 10 to 55 GHz and at least 7 dB (and typically 10 dB) at higher frequencies from 55 to 110 GHz. For applications requiring multiple couplers on multiple channels, such as high-frequency antenna beamforming systems, the unit-to-unit coupling tolerance (coupling consistency from unit to unit) is also quite good, within ±1.50 dB across the full bandwidth from 10 to 110 GHz. KRYTAR’s technological advances provide excellent operating performance of this new stripline design unit. The coupler exhibits Insertion Loss of 5.5 dB (max.) across the full frequency range including coupled power. Maximum VSWR is 1.8:1 at any port 10 to 50 GHz and 2.5:1 at any port 50 to 110 GHz, Input Power Rating is 20 Watts Average and 3 kW Peak. Operating Temperature is -54°C to +85°C. This new directional coupler is in an extremely compact package which measures only 1.55 inches (L) x 0.38 inches (W) x 0.80 inches (H). With the standard 1.0 mm SMA female connectors the coupler weighs just 1.2 ounces.